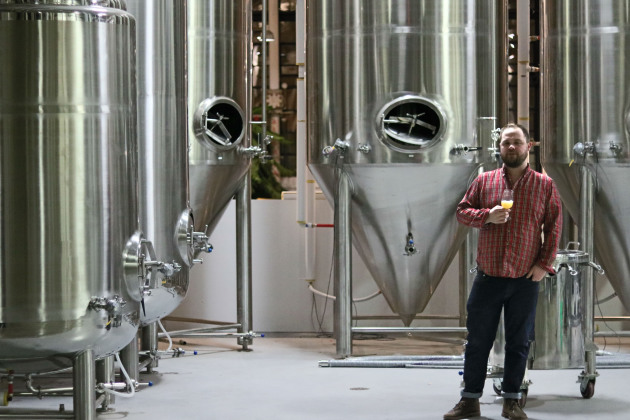 The latest brewery and taproom to jump into the Twin Cities market is Black Stack Brewing, located in the sprawling complex at 755 Prior Ave. N. in St. Paul in the same building where Can Can Wonderland opened earlier this month. “We’re mutually thrilled to have each other in this building as kind of co-traffic drivers,” said owner Scott Johnson. The Johnson family hopes to open the taproom in their 20,000-foot space next month after three years of planning, brewing and waiting for various approvals. The family’s involvement with beer began just over 20 years ago, when they owned a high-end imported beer distribution company called All Saints Brands, Inc. When in 2011 the so-called Surly Bill made it possible for breweries to also have tap rooms, the temptation to upstart their own operation was just too strong. Thus a new family project was born. Johnson partnered with Bob DuVernois – the former head brewer at Excelsior Brewing – and then got everyone else involved. Wife, Shawne Murphy-Johnson, handles marketing, 26-year-old son Murphy (pictured, above, in photo courtesy of Black Stack) has been training as the assistant brewer for the last year and a half, 23-year-old son Cooper works in sales and 16-year-old daughter Quinn is in charge of environmental efficiency and social media. When the 5,000-foot taproom opens next month, Johnson and Co. are planning to debut four or five beers. The staples will be Ratify, a white wheat beer, Spare Parts, a dark lager and an ale-lager fusion called Punch Press. Other styles expected to be on tap soon: a Belgian-style table beer, and a Northeastern-style IPA. Currently, they’ve got a recipe catalog 93 batches deep – the results of long stretches in a holding pattern while they waited for various approvals. And they’ve got the capability to experiment with plenty more, with a 5,000 barrel capacity. The plan is to rotate a new beer into the mix every couple weeks once they get up and running. Perhaps that explains why the bunch is already plotting their next move. After purchasing the recipes for and rights to an Idaho cidery called Seven Sisters that went out of business, Johnson is hoping to begin cider production as well in a year or so. “But we’ve got to relax a bit before we get to that stage,” he said.